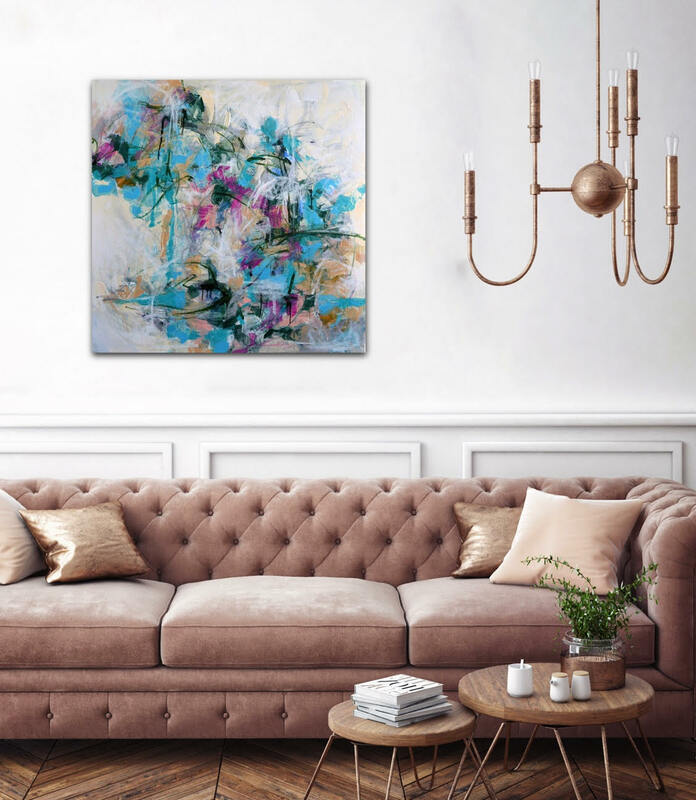 The balance of cool and bold work perfectly in artist Debbie Boyd Hageman’s work. All images courtesy of Debbie Boyd Hageman. New Orleans-based artist Debbie Boyd Hageman has always looked to mother nature for inspiration, solace and refuge. From the time she was a little girl out in the garden with her mother, helping to grow their vegetables, to photographing and painting outdoors in her beloved New Orleans, Boyd Hageman finds her creativity flows best when outside. “I look at the landscape and I see something new every time,” says Boyd Hageman. 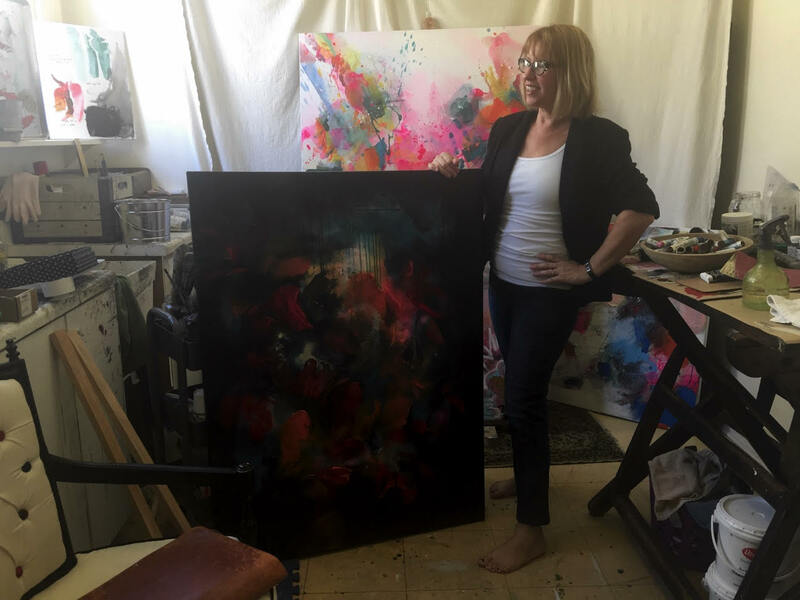 She paints big, bold, colorful abstract paintings for commercial and retail clients around the globe. The Philly native spent a good chunk of her childhood in the state of Indiana. In her early 20s, she headed south to Florida, where she began her artistic career. Though she had always painted and briefly spent time in college art classes, it wasn’t until the then 20-something hit the Sunshine state that she was able to sell her paintings and confirm she could be successful as an artist. Her use of both bright and muted colors, often together, is part of what makes her art so appealing. Though she does sell smaller pieces so that her art is accessible at all price points, Boyd Hageman mostly creates larger pieces that can stand on their own. “I tend to express myself best using large-scale canvases,” she says. 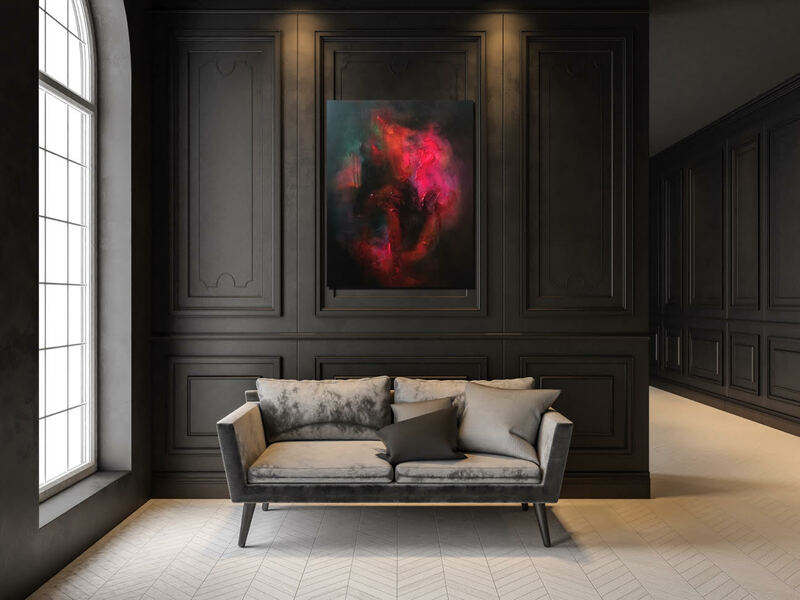 Deep, dark colors from artist Debbie Boyd Hageman work well in a monotone room. For this busy artist and mom, it truly is all about expression. The prolific painter is also a talented cook who makes most of her family meals daily – and from scratch. Working as an artist has allowed her to spend more time with her husband and two children. Her family also loves the outdoors. Often, they will walk the levee overlooking the Mississippi River. The scenic walk is just a few hundred feet from her front door in the Algiers Point neighborhood of New Orleans. It’s that kind of freedom she finds most appealing. “I love that I make my own schedule, set my own rules and can truly be myself,” she says. New Orleans-based contemporary artist Debbie Boyd Hageman in her studio. The artist has set up a studio in her home and posts pictures of her process almost daily. Many collectors buy their pieces directly from Boyd Hageman through her social media channels. She says those channels are like a virtual art gallery and she has a huge appreciation for them. Some artists she follows and admires on Instagram are Adam Handler, Eileen Noonan and Joseph Conrad-Ferm, as well as many others. The busy artist also sells her pieces at various art galleries and artistic spaces such as the Broad Theater. Plus, she sells at local hotels like the Old 77 Hotel through the curated collection from Where Y’Art. She also has pieces in the permanent collections of The Jung Hotel, Pigeon and Price and The Brent House Transplant Institute. On days when her schedule and mother nature align, the natural beauty will pack up her paintings and her gear and head to the famous French Quarter. There, she often sets up shop in Jackson Square with a multitude of other talented artists. “It’s a real community of people who take care of one another,” she says. She adds that she learns a great deal from her contemporaries on everything from the location of the best parking spaces to easy ways to haul canvases and equipment through the busy streets. For more information on Debbie Boyd Hageman, visit her website or follow her on Instagram or Facebook. The post New Orleans Artist Debbie Boyd Hageman Looks to Mother Nature appeared first on Freshome.com. ← What Classifies A House Style: What Makes A National Home?